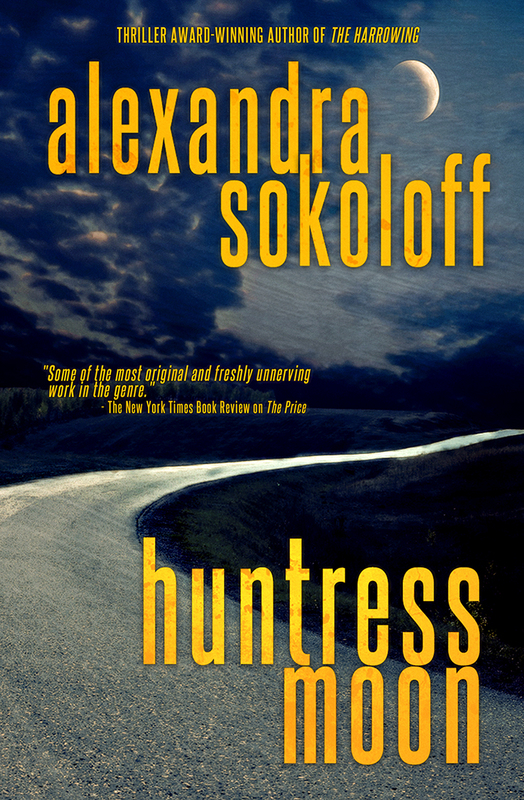 Alexandra Sokoloff: Huntress Moon - new FBI thriller out this week! 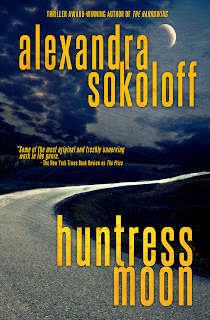 Huntress Moon - new FBI thriller out this week! This week I'm launching my new thriller HUNTRESS MOON as an e book: US, UK, and worldwide. FBI Special Agent Matthew Roarke is just closing in on a bust of a major criminal organization in San Francisco when he witnesses an undercover member of his team killed right in front of him on a busy street, an accident Roarke can't believe is coincidental. His suspicions put him on the trail of a mysterious young woman who appears to have been present at each scene of a years-long string of "accidents" and murder, and who may well be that most rare of killers: a female serial. Roarke's hunt for her takes him across three states... while in a small coastal town, a young father and his five-year old son, both wounded from a recent divorce, encounter a lost and compelling young woman on the beach and strike up an unlikely friendship without realizing how deadly she may be. I said I was going to get practical here about practical aspects of e publishing and e marketing, and some of my readers have been pretty rabid about wanting me to do a whole e workshop-type thing on e marketing. So I'm going to take you through some of this today. Unless of course you CAN'T WAIT to read the book, in which case this post will still be here tomorrow! First, I've already done my Kindle Select free promo to launch the book, which is no longer free but still a deal at $3.99. And if you're an author, these also happen to be some things that are vital for YOU to understand, print out, file someplace you can always access them, and better yet, memorize - because you're going to have to ask your own friends and readers to do them when YOU do a Kindle Select promotion. So go through these steps now for me, and you will know and understand what YOU will need to do with your own book. I have ALWAYS heard from my mega-bestselling friends about the importance of giving books away, as many as possible, always. What authors need to do to be read is to hook readers. Come on, you know how it is. You have authors you love and will read anything they put to paper. I know I do. The only thing I need to see on a book cover is their name. I am rabid about my favorite authors, there's no kinder word for it. So the point for an author of giving books away is to trawl as widely as possible and find those rabid readers, who will then follow you and buy anything you put to paper for the rest of their lives. Drug dealers know all about this, and always have. You have to HOOK people with freebies to get your regular customers. And Amazon knows that, or lucked on to it somehow, and figured out a way to trawl unprecedently widely, for free. Only my book was free. One click and it's yours. And even if you don't download it, your incredibly retentive brain will associate my name with Stephen King's, or someone else almost as famous and irresistible. And that's the WHOLE POINT of advertising, people. Subliminal association. Which Amazon has down to a scary kind of science. And - if enough people download a free book over your couple of days of free promotion, your book might garner enough readers to stick on the PAID bestseller list. And that's the REAL goal. It works. The books I've already put in the Select program over the last two months are now up on the Top 100 Paid Amazon bestseller lists right now, next to authors... well, some of which I never even considered human, writing gods like H.P. Lovecraft and Stephen King, and others I am honored to be in the company of (not to mention I would kill to have their sales) like Dean Koontz. Do I want my books up there next to THOSE names for tens or hundreds of thousands of potential readers to see, with a one-click BUY link right there? Do I? Do you? So today, and in days and weeks to come, I will walk you step by step, through some of the most important aspects of a promotional campaign. I am going to talk you through the things that YOU can do as a reader to help promote MY book, so you understand each step and then explain it to YOUR readers when YOU need to promote your book. I really encourage you to do ALL of the following. Not just because it will help me, which it most definitely will, but because it will make you understand the process that you will need to explain to YOUR friends and followers. When you click on this link to download your copy of Huntress Moon, before you click that orange BUY NOW button, please take a second to LIKE the book. At the top of the page, right under the book title and my name (and right next to the book's 5-star review!) there is a button with a little "thumbs up" icon. Just click on that. And you're done. If you're not accustomed to "Liking" you need to get comfortable with it. This is a split-second way to support your favorite authors and friends, and it's good karma to do it as often as possible. Clicking that LIKE is a vote for the author, and believe me, it counts on these big sites: on Facebook it means exposure and on Amazon it means that author instantly moves up on the Recommended lists (which we'll get to). You really are financially supporting authors if you do that one very little thing whenever you see a LIKE button on an author's page - or Facebook post. Every time I buy a book by a favorite author, or am just doing research and come across one of their books, I LIKE the book. You don't have to buy the book to support the author! Just click and LIKE them! After all, you do, don't you? Now that you've done that, click on the orange BUY NOW button on the right of the page to get your free copy. Now go to my Facebook profile page or my public Facebook page and click "Share" on the post about HUNTRESS MOON. A comment is always fun, and a Like counts, but the real juice is when you Share. That means all your Facebook friends who have never heard of me — or who have heard of me and have been avidly awaiting my next book! — will be able to see the link to my book on YOUR wall and will hopefully be intrigued enough to download it. Also note that I've created this FB post in a way that will translate to all the major social media sites: Twitter, Facebook, LinkedIn, Google +. Which means basically that the post is under 140 characters (to fit on Twitter and not annoy the other sites), it contains the link to buy the book (and on most sites will display the book cover and a short part of the book synopsis), and all people have to do is click on the link to go to the Amazon page and read more and potentially download or buy. Did you know that you can ALWAYS like and share any of the blog posts I do on this site by clicking the buttons at the bottom of the post? Really! Now, if you're truly inspired you can Tweet about Huntress Moon, too. First, you can Tweet this blog post (meaning post it to the social media site Twitter.com) by simply clicking the T icon at the bottom of this blog post as I just explained above. Yes, we will do a dedicated session on social media, including the mysteries of Twitter, but the basic points of the above sample tweets are that they are under 140 characters, and the hashtag (that's #) labels at the end will ensure that the tweets will be fed into the Twitter search engine, where readers and websites who are on the prowl for free books will be able to see then, which creates more exposure and possible click-throughs for the book. There's one more thing you can do that will help the book a lot and that you need to be familiar with if you're going to be selling your own books. Go back to the Huntress Moon Amazon page and scroll down, past the book photo, past the reviews, past my photo and bio, and a bunch of tiny bookcovers to the section that says Tags associated with this product. In that section are lists of a bunch of descriptive phrases listed like fbi series, female killers, mystery and detective, police procedural with little boxes beside them. Click on each one of the little boxes next to the key words and phrases you agree with (up to 15 of them) to identify the book as being about those subjects. That moves the book higher on a list of books about those subjects. Or you can add tags of your own in the bigger box below the tags, or as the instructions say, by pressing the T key twice to get a box, and just entering a string of phrases like (fbi series, female killers, female serial killer, suspense thriller, serial killer, mystery and detective, police procedural, hard boiled mystery, psychological thriller ) etc. We will have a WHOLE post on tags and how important they are, and you should definitely do them for your own books, and any other book you like. But first, go through the above and tag, so that you know how to do it and will hopefully remember it's important. The above things may make no sense to some of you. But if that's the case, I implore you to just go back to # 1 and TRY the steps. The way to learn social media is just to bash your way through the steps. Repetition is the mother of skill. You don't have to Like the book before you've read it, but you can tag the book with appropriate subjects, and you will have learned tagging. You can Share this blog post, or Like my Facebook page. Try it for the practice and if it still makes no sense to you, then ask lots of questions in the Comments and we'll talk about it! There are so many things that we need to cover on the e publishing front and the only way to really assimilate this kind of thing is to practice, and copy what other people do successfully. In fact, I encourage writers to adopt the practice of Marketing Monday. No, it doesn't have to be Monday, it's just awesome alliteration. What it means is that you take ONE day a week and use your allotted writing hours that day to do marketing and promotion instead (which can just mean reading a book or a blog post on marketing!) My career always goes much better if I devote the time to do this. It will focus you and get you and your books out there in ways that you never would have thought to do otherwise. It will pay off, I promise. So please - questions? This is my first attempt at explaining e pub issues, so if things are not clear, it's undoubtedly my fault, not yours. Tell me what you're dying to know, and we'll talk about it! Thanks, Alex. Look forward to reading! This is the reason why I love your blog and your writing. You break everything down to the fundamentals. Thanks, Constance! I know this is a lot of stuff, but there really is a process to all of this that works and makes sense if you take the time to learn the hows and whys. It's HARD to explain in writing, though! Fiction is so much easier! The problem with Liking a book on Facebook or on Amazon is that I don’t want to do that before I’ve actually read the darn thing. Granted, there are authors with whom I’m fairly confident I’ll enjoy whatever they put in front of me but still that feels somewhat dishonest. Helpful to the author, sure, but dishonest. And when I finally have read the book, it’s all too easy to forget about promoting it. Same applies to writing about it on my Facebook page. If I do enjoy the book I might well do that but I don’t want to spam my friends about every purchase I make. I’m very much looking forward to reading more about your adventures in ebookland. And on another note, now that you have a series going, how about sharing some thoughts about what goes into planning a series, structurally and otherwise? Thanks for trying it, Patricia! You're right of course, Aleksi, I don't Like things I haven't read, either, but I can Like blog posts about a book, that kind of thing! And yes, I am planning to blog about writing series, for sure! I'm in the middle of the sequel to Huntress right now and the series thing is about all I have on my mind these days! Done and done. Thanks for leading me through the process. I haven't paid enough attention to the share or like buttons and this was a good kick in the pants to get me started. P.S. Thanks for making me feel less guilty about downloading your book for free. Ken, it's a weird thing, the power of those little buttons. I certainly didn't grow up with any of this - it's a whole new language and way of thinking we have to assimilate. Amd who has time to learn this stuff? NONE of us! But we have to. More and more I just try to do things AS I think of them so they're done and not taking up space in my head. I'm a new reader and I did enjoy the book, finished it in under a day! You did a good job writing from a male POV and character development was unique and well-done. I was a teensy bit frustrated with the ending and can't tell if you ended it that way because there's going to be a sequel or if that's just the ending. I don't wish to say more because I don't like spoilers. I went looking for the next book in the series to find that this is your newest book. Good marketing strategies, very solid advice. I used to have my own business, everything you said was dead on. Yes, it's a series, and really - would you have WANTED it to end one of the two ways it obviously would have ended if it had ended for good? I think that would have been just terrible and heartbreaking for everyone concerned. I purchased Huntress Moon for mu Kindle and I just finished the book yesterday. i have to say it was amazing!!! Is there going to be a 2nd book for this story? I am so enthralled with the story line. I will be adding a "LIKE" on my FB page for sure! thank you for a great book! Mistie, thanks so much for reading and for taking the time to post feedback, you're a doll! Yes, I'm hard at work on the sequel right now, and there will be at least a third book, too, that I'm already making notes on.